Why there isn’t any traffic on my website despite I’ve spent a healthy amount on the theme? This question irritated me for two months. Those sleepless nights worrying about the amount of investment I’ve made on my website. Still gives me shivers. Before I even asked about it, he was gone like a wind. But I was forced to give a second thought to the WordPress theme that I was using. This got me thinking. What makes one premium WordPress theme better from another WordPress theme. Besides your personal view, an effective theme must bring traffic to your website. 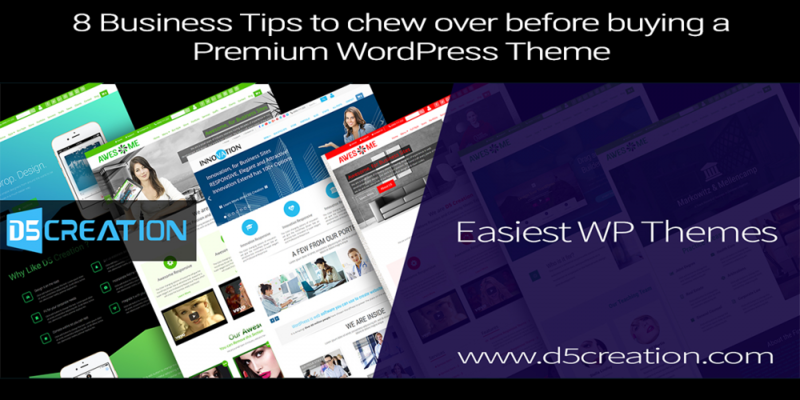 So, before buying premium WordPress theme, you need to consider these tips which will help you to make the right choice. There are always some things that go beyond the human eye. Choosing the right WordPress theme is tricky. You need to be cautious when choosing the theme. At times, the demo is not enough to judge the theme in real. Lucky for you. This blog post will help you identify the perfect WordPress theme for tour business. Sit back. Relax. And have a lot of fun while I disclose these insanely simple tips that will help you to save some time and couple hundred bucks. Just like humans, nothing is perfect. Some themes score high in the features department while scoring poorly with the interface. Others have a gorgeous interface, but they lack the basic functionality in them. You need to find that perfect balance. Where user loves your website enough to engage with it & purchase while they are on your site. If the theme is not pleasing visually, it will be difficult for the customer to stay on it for a long time. Sure, you can waste some hours re-writing the CSS code or alter the design, but with this time you can seek another theme with a greater balance. You must compromise on the features to an extent. But, you can cover that up with plugins. A word of advice here. Try not to use too many plugins in your theme. This will slow down your website. If you’re planning to change the design of the theme. This too is not an easy task. You can try out free WordPress themes that will satisfy 60% of your needs. The rest you can go for premium WordPress themes. The good news is, there is so much to choose from the internet. The theme you choose should be backed with easy-to-use customization options. Based on your choice you can modify the aesthetics without losing the theme value. Even if you don’t find the perfect theme, you can hire a developer and customize your theme a little bit. Most of the customers don’t bother to review a theme unless delights them or annoy them. And in that case, they usually write long frustrated paragraphs. To find the review of the theme, just type [theme name] review on Google and you will get the review of the theme that you’re willing to purchase. If you still don’t get any results about the theme, you can ask in Facebook web developer groups to get an idea of the theme. Just in case you’re thinking what is the impressive rating at which you should buy the theme. Well, the average is around 4.82 – 5.0 and the theme need to be rated by more than 400 users. If you’re still confused with the rating of your theme, try searching the theme with this query “discussion of [theme name]”. Most of the popular themes are discussed in discussion boards on the internet. If your chosen theme is a good one, or even if it lacks something you will know about it. You can gauge the quality of the theme by the comments of the forums and if there are development issues with the theme you’ll know about it. Do you have a limited budget for your start-up? Time to dumb-in your worries. As a general rule of thumb, you don’t need an expensive WordPress theme, no matter how good it is. Figure out the purpose of creating your website. Based upon the level of your purpose, you can choose the theme that support goals of your business. Can you use your theme on multiple websites? Are there any updates on the website that you need to be aware of? Is the free customer support included along with the theme purchase? Does the plugin support you’re getting & which features you need to pay once you’ve purchased the theme? Some themes offer one year subscription of free customer support, others charge a little amount for it. Depending upon the need of your business, you can seek the pricing range that you want. There are tons of theme shops out there offering licensed themes and are directly linked to the developer of the theme. If you are living in a cave and don’t know about WordPress theme bundle, here is an insight for you. A theme bundle contains a WordPress theme and a couple of other resources that will help in the business. If you search for licensed WordPress Themes you’ll know that an average theme will cost around $59 with a limited customer support & any new update. However, on higher grounds, a great theme will cost around $70. On average your theme will cost in between $40 - $70. A word of advice here is that don’t go for a cheap theme. Creating a website is a one-time thing. You’re setting up a website to generate leads and make some sales if you choose a cheap theme this purpose will not be served. Sometimes, a WordPress theme will come along with a premium plugin purchase. Here, search for bundled plugins. Which will be great value for money and save you bucks up to $400. But keep in mind that few of the theme shops claim to give away premium plugins along with the theme, but they don’t. Several bloggers use ads on WordPress to generate passive income. There are making a good earning by running ads on their WordPress blogs. On the other hand, businesses don’t offer ads if the business resolve around a niche software or a product. Whether you’re planning to run the ads now or in future, it is always wise to take the safe path. Choose a WordPress theme that is SEO-friendly and is optimized for monetization. The extra amount of money won’t hurt anyone but ensure that this doesn’t cost the reputation of your business. If your business is serious about company reputation, it is good to go for a professional theme without ad monetization. SEO is the heart of any company. If your theme is not SEO friendly, it will double the effort of your SEO guy. So, the best option is to go for a WordPress theme that is the SEO-ready theme. This will save a lot of your time and bucks. Apart from this, you need to make sure that the theme is user-friendly. But how will you know that the theme is SEO-friendly or not? All the developers you come across will claim that their website theme is SEO-friendly, but there is an easy way for you to judge the theme. The first indication of an SEO-friendly website is that they use a clean & semantic code that is according to the web standards defined by the authorities. If you still have no idea on the importance of SEO of the website, go consult a website developer and he will help you to determine the right SEO-friendly theme for your business. This is not even a question, is it? Nothing wrong with a static WordPress theme if your target audience is desktop users. But know that according to Google you’ll just be missing around 63% of the website traffic. You can capture this traffic with a mobile-friendly website but that doesn’t mean the same thing. You’re still missing most of the traffic that is being capitalized by your competitor. Customers are moving from desktop to mobile. More than 74% of the consumers are using smartphones to purchase products online. Do you want your customers to go through a painful process of zooming in and out to view the whole page? Not at all. Say bye to the fixed-width website, say hello to responsive websites. Go for a website theme that not just looks amazing but performs flawlessly on all the devices. This might look like a tiny detail, but when done right this will create a huge impact on your sales. It’s 2018, not 1999, and responsive website design is a must for every website, no matter how small it is. Not just the images, you need to ensure that every element of the website is responsive. The only problem with the brand-new theme is that they might have plenty of bugs in it. On the other hand, the most popular themes in the market will have few bugs. Therefore, old themes can be the right choice for your business. It is up to you to decide which type of theme you prefer. If it comes down to personal choice, some might think that the hot trendy theme is the right choice, but what if the next week there are bug fixes on the theme. Anyways, go to the most popular theme shops and browse the themes. Keep in mind the review and feedback. Read every feedback. Check what the customers and even the developers are saying about the theme and bugs, the updates, and the performance of the theme. This is a no-brainer. Most of the theme supports the social media integration. You need to figure out, which of the plugins can be integrated into your theme. Moreover, you can take the help of various online tools that can assist you in placing the social media buttons to best-fit your audience. The good thing is, some of the themes have built-in social media buttons. So, you don’t necessarily need to buy premium plugins for the social media buttons. If you like the ones that are in the theme, go with that. If you want to generate more sales, of course, you do, you need to integrate your social media buttons in the theme. Whether you chose the pre-defined theme, or you purchase the premium plug-in, ensure that your website doesn’t get heavy. Use a plug-in that serves the purpose without affecting the speed of the website. If the plug-in is making your website slow, it is not worth it. Try to minimize the speed factor as much as you can. It is not about finding the perfect WordPress Theme, it is about finding the right balance that will fit-in your business model. The tips mentioned above are collected by experience and are not just random tips. If you’re serious about starting a business and moving on with a full swing, it is time for you to get serious about choosing the theme that is right for your business.